Guidant Financial and LendingClub teamed up to survey more than 2,700 current and aspiring small business owners across the nation. Read on to discover insights on aspiring entrepreneurs, from who they are to what’s holding them back from pursuing their small business dreams. Who Aspires to Open Their Own Small Business? In Guidant Financial and LendingClub’s State of Small Business survey, we saw responses from aspiring entrepreneurs across many demographics. We dug in to see what motivates and challenges this group of would-be small business owners. This year saw an 18 percent increase of aspiring small business owners in the “baby boomer” generation, at 51 percent. Meanwhile, there was a 28 percent decrease in the share from millennials, leaving this younger group at 19 percent. The share of Gen X aspiring entrepreneurs remained about the same from year to year, at 30 percent. Seventy-five percent of aspiring entrepreneurs are men, while only a quarter are women, comparable to the national average of current small business owners at 77 percent male and 23 percent female. Generational breakdowns show a large gap between aspiring millennial male and female entrepreneurs, with 83 percent male and only 17 percent female. Meanwhile, 71 percent of aspiring Gen X small business owners are men, with 29 percent women. Finally, 74 percent of boomer aspiring entrepreneurs are men and 26 percent are female. 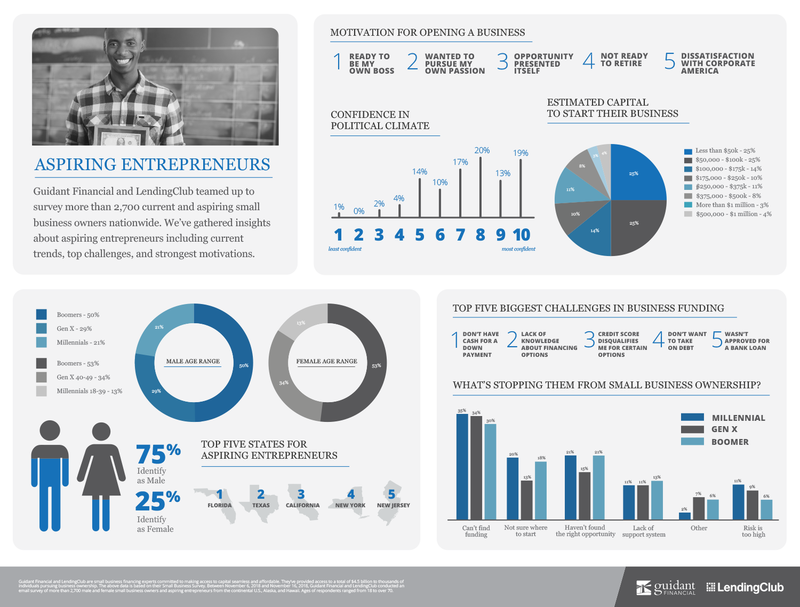 Aspiring entrepreneurs shifted more towards moderate levels of confidence in the state of small business given the current political climate – on a scale of nine to 10 (10 being the most confident), there was a 13 percent drop in respondents answering nine or 10; ratings that indicate the highest possible levels of confidence. However, the average confidence level remains high, with male respondents averaging eight and female respondents averaging seven on the scale. Being their own boss motivates more aspiring entrepreneurs than the average current small business owner, with 37 percent of would-be entrepreneurs reporting this motivation compared to 26 percent of average current entrepreneurs. However, the same percent of both are motivated to pursue their own passion, at 23 percent. From not knowing where to start to trouble obtaining financing, there are many barriers between aspiring entrepreneurs and the start of their small business journey. These barriers can shift in severity due to many variables. An inability to find funding is the most common situation stopping aspiring entrepreneurs from opening their businesses. Fortunately, fewer aspiring small business owners are struggling with finding funding, with last year’s share at 36 percent and this year’s down to 31 percent. It’s a testament to the eagerness of would-be entrepreneurs that high-risk is one of the least common barriers, showing that these motivated individuals are ready to embrace potential risk to follow their aspirations. As costs rise, so does the estimate that aspiring business owners have for the capital they need to start their businesses. Sixty-four percent of aspiring entrepreneurs estimate they need less than $50,000 to $175,000 of capital to start their businesses. Twenty-nine percent estimate they need between $175,000 to $500,000, while only 7 percent need $500,000 to more than $1 million. With the inability to find funding as the number one challenge across all segments of aspiring small business owners, it’s no surprise that there’s a bevy of difficulties associated with acquiring financing. While funding challenges vary in difficulty across age and gender lines, a lack of cash, not knowing financing options, and problems with credit scores rank highly for most would-be small business owners. Aspiring millennial small business owners are the least concerned about taking on debt, likely due to the generation’s focus on achieving goals with structured planning. However, as more Americans take on debt than relieve it, the hesitation of older generations to take on more debt, especially as they come closer to retirement, is understandable. More millennials also reported being denied for bank loans (14 percent) than Gen Xers (11 percent) or boomers (10 percent). Financing can be a major challenge for any aspiring entrepreneur, whether it be due to bad credit, a lack of cash on hand, or denial of a traditional loan. The key to success for these motivated but uncertain aspiring small business owners may lie in non-traditional financing methods such as 401(k) business financing (also known as Rollovers for Business Start-ups), SBA loans, or unsecured loans. The dream of business ownership reflects the American dream of success and echoes across age, race, and gender. This entrepreneurial dream motivates and inspires all aspiring entrepreneurs to find the key to their success, no matter the challenges in their way.